G E T Y O U R C O P Y N O W ! ...and place your order now! Also available in a well-equipped record store near you! Not convinced? Check out the clips at the Escape Music artist page and you will be! 14th December 2004 There have been no news updates for a while, because yours truly has been very busy for the past few months. However, H of M are doing great, and I hope you have caught all the nice magazine reviews! The band are demoing and preparing songs for their upcoming second album. The recording sessions will start around February/March 2005. Stay tuned for updates on how the events unfold! There will be another appearance in the Never Surrender Club, the exact date will be announced later. 10th August 2004 Human Temple has cancelled their appearance in the Never Surrender Club on the 25th of September due to other obligations. House of Mirrors will appear nevertheless! 4th August 2004 The album should be out in Japan today on the Art Union label! 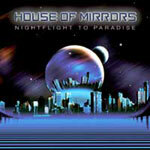 2nd August 2004 House of Mirrors has made it to the AOR Heaven top 10 list!! COOL! 22nd July 2004 Melodic.net reviewed Nightflight to Paradise and said, among other things, "goddamn how good they sound" and "a fantastic debut album"
21st July 2004 Nightflight to Paradise will be featured in the next issue (No 58) of Powerplay Magazine (UK) available at the end of the month. Thanks, Rob! 20th July 2004 Correction! House of Mirrors will play Never Surrender Club at Downtown Turku on the 25th of September together with Human Temple. Be there or be elsewhere! 17th July 2004 I've been on holiday, so the web site has been a bit short on maintenance for the last couple of weeks. Anyhow, there's another review of Nightflight by Urban "Wally" Wahlström at RockUnited.com. Why not pop in and check it out? 4th July 2004 Happy independence day to US of A! Our offering for today is another review (in German) from the folks at Powermetal.de! 30th June 2004 The forum is temporarily down due to webmaster error. 27th June 2004 The House of Mirrors forum is now open! Vote for your favorite House of Mirrors song there! Note: you are required to register to view the discussion groups! 26th June 2004 Web-site makeover! Also added some cool pictures from the "album release party" held in an old jail in Paimio, Finland. It was an extremely cool exclusive party thrown just to the closest supporters of the band! 23rd June 2004 George Thatcher from Glory Daze (the coolest name I can think for a web site) reviewed Nightflight to Paradise. Go check it out! 18th June 2004 Another great review by Mika Penttinen at www.imperiumi.net (in Finnish). Kiitos! 16th June 2004 5 out of 6 stars at RockReport.be!! 12th June 2004 Jaakko's interview by Nicky Baldrian now online at AOR DREAM ZONES. See also Nicky's review of Nightflight to Paradise! 7th June 2004 Another nice review at Sonny's Rock & Metal Heaven (in German). Thanks a bunch, Sonny! 5th June 2004 If you happen to live in Germany or nearby, check out the interview of the band in Rock It Magazine! 4th June 2004 Lots of thanks to MelodicRock.com for a nice review! Muchly appreciated! 7th April 2004 It's official! The scheduled release date of the House of Mirrors album is June 14th 2004! Exclusive preview of Nightflight to Paradise at MelodicRock.com! 22nd March 2004 Some "behind the scenes" pictures added to the media page. Go check them out! 13th February 2004 The album is recorded and we are well into mixing now! 2nd January 2004 Again the band and the website crew want to wish a very happy new year to everyone!